Jonathan Kipnis is professor of neuroscience and director of the "Center for Brain Immunology and Glia" (BIG) at the University of Virginia. In his research, he strives for a better understanding of the complex interactions between the immune and nervous system. With the introduction of the concept of "brain lymphatics", he has broken new ground for research in neuroimmunology. 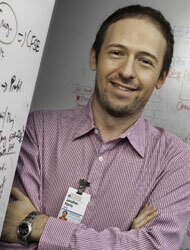 In Mainz, he will build up a new research group at the University Medical Center. He will collaborate with the colleagues at the Focus Program Translational Neuroscience (FTN) and the Research Center for Immunotherapy (FZI) and participate in the work of the Transregional Collaborative Research Center SFB TR-128 "Initiating/effector versus regulatory mechanisms in Multiple Sclerosis – progress towards tackling the disease". SFB TR-128 "Initiating/effector versus regulatory mechanisms in Multiple Sclerosis – progress towards tackling the disease"